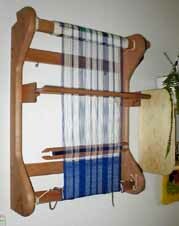 "Rigid Heddle Loom - more"
This loom is great at its ingenious simplicity. The rigid heddle from its name performs both the functionalities - classical heddles and the beating frame with the reed together. This handheld reed is alternately lifted up and pushed down and so substitutes two common heddles and makes possible the tabby weaving. That is why its name is also The Tabby Loom. By this weave the patterns are created only by combinning different colours of warp and weft yarns and it is possible to variegate the pattern by use of special techniques. 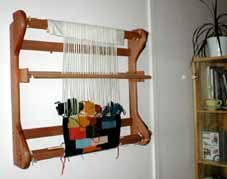 This loom takes minimal place and it is ideal to hang up it on the wall (with the unfinished fabric), no cleaning, no preparing to weave and in addition you have got the decoration on the wall. It is light, the manipulation with it is easy, the widest loom 80cm hefts only 4,9kg, the 40cm one has 3,6 kg. There is mystery for many people who had never wove and that is the warping of the loom. We can tell you, it is really simple, alike all the treatment with this loom. Suffice it once to see and to try (the warp is threaded through only one reed). The next thing we would like to say you, is finishing of the wood. Our supplier recommends swabbing of the surface by his special natural wax polish. If you don't want to do some other surface finishing, we offer you the recommended original Wax Polish.